The project titled "Disaster Resilient Cities: Forecasting Local Level Climate Extremes and Physical Hazards for Kuala Lumpur" funded by Innovate UK&amp;EPSRC - Newton Ungku Omar Funds as part of the Future Cities scheme has been launched in January 2017. For a 34 months duration, this project will look into physical and atmospheric hazards in Kuala Lumpur, with close collaboration with University of Cambridge, British Geological Survey, JBA and the Southeast Asia Disaster Prevention Research Initiative, Universiti Kebangsaan Malaysia (SEADPRI-UKM), among others. UCL Epicentre's Prof Dina D'Ayala, Prof Tiziana Rossetto, Dr Liora Malki-Epshtein and Dr Yasemin D Aktas, as well as UCL MSSL's Prof Mark Saunders will be working in this project. 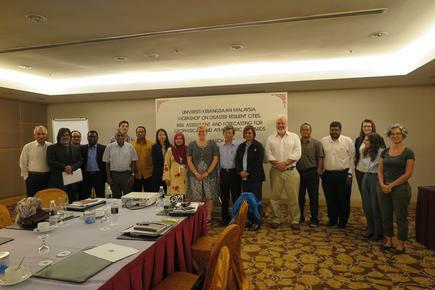 As part of the project launch activities, a workshop on Disaster Resilient Cities: Risk Assessment and Forecasting of Geophysical and Atmospheric Hazards was held in Kuala Lumpur in March, with attendance from a wide range of Malaysian governmental departments and agencies. Dr Yasemin D Aktas attended the event, and delivered a talk on "Urban Micro-Climate and Sustainable Building Design in Hot and Humid Climates".